"It's not one of those restaurants with foams, is it?" she frowned, her nose wrinkling in distaste. 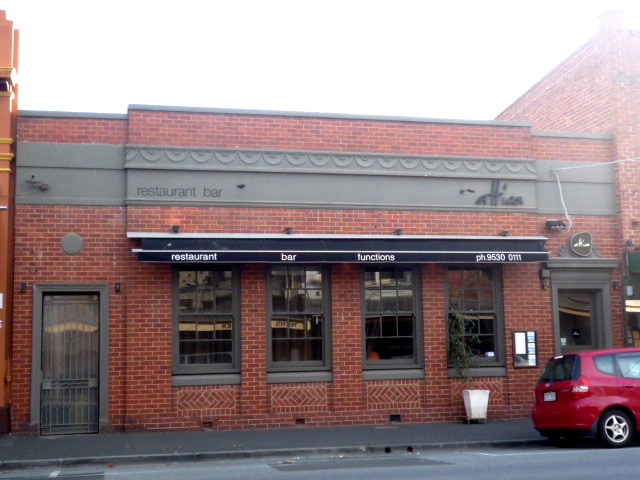 A few weeks before my birthday, Mum and Dad had asked me where I wanted to be taken for dinner. When I immediately said Attica, her disparaging retort about foams was due to the fact that, unlike Rumpole and me, Mamma vehemently dislikes molecular gastronomy (or Nueva Cocina or Techno-Emotional Cuisine or whatever the cool kids are calling it these days) - yes, she even disliked the amazing degustation we had at Interlude the night I was admitted - so she's instantly suspicious of any place that features foams, gels, emulsions or (shudder) spheres on the menu. "No no no, it's not that sort of place. I can't promise there won't be foams on the menu, but I've heard it's more informal and friendly and I really really want to go!" In the end we struck a Faustian bargain: she'd come along with us if we promised to order from the a la carte menu, rather than getting the degustation (meals that go on and on for hours and have more than three or four courses are another pet hate of hers). 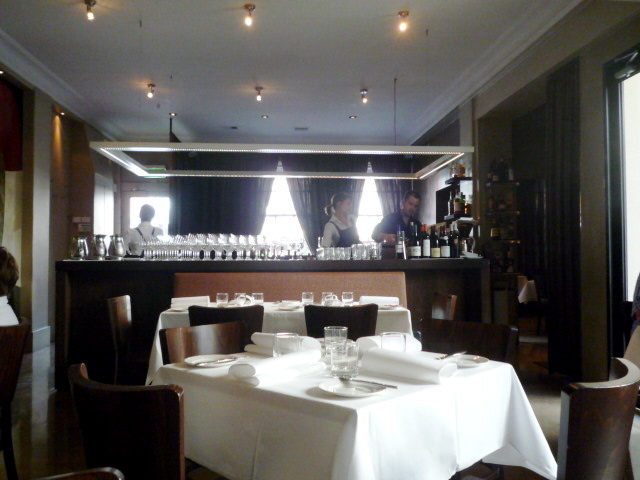 You can take it as a given that the setting, the wine list and the service were all exceptionally good. The sommelier and staff were most knowledgeable but not at all snooty. 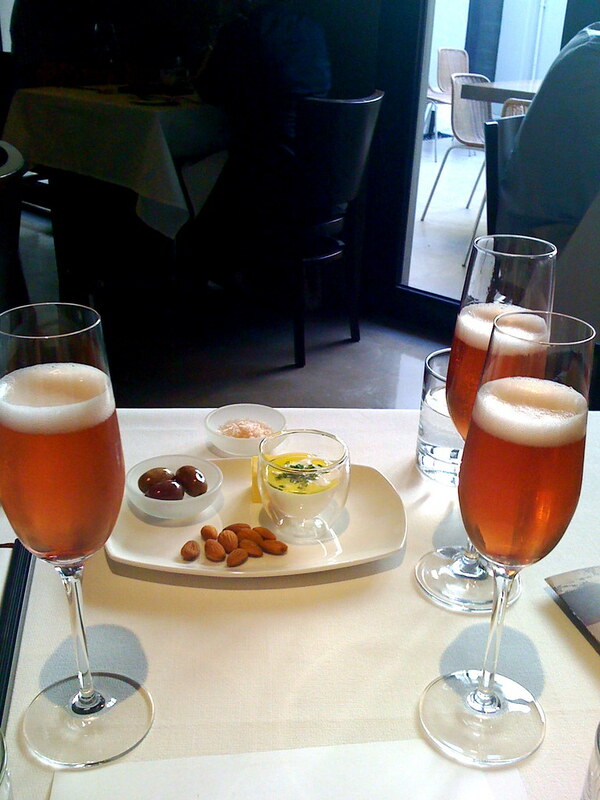 We started with a few Kirs Royaux and sampled the delicious fresh breads that were served with fromage blanc (made that morning), almonds, olives and pink salt. Of course I was unable to resist ordering Attica's signature dish, the smoked trout broth with crackling, basil seeds and fresh smoke ($23). Talk about cuisine as theatre! 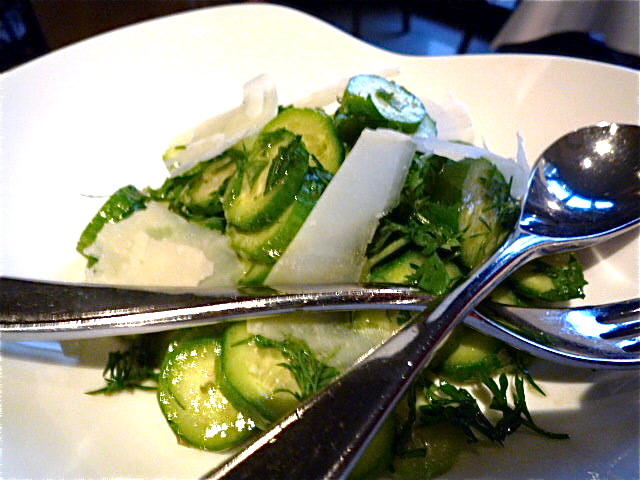 Watch the series of pictures of this dish on the Attica website to get an idea of what we experienced. The shallow bowl was brought out from the kitchen, without liquid. Sitting in the middle of the bowl were the cubes of trout, pieces of crackling and powdered sorrel oil, all covered by a stemless wineglass. Like something out of Hogwarts, the wineglass was filled with hickory smoke (prepared out the back using a bong) - and was smoking the trout before our eyes. With a hint of panache our waitress removed the wineglass, allowing the curl of hickory smoke to waft up to the ceiling as it evoked memories of log cabins in the Rockies. She then deftly poured a beaker of steaming hot broth and baby basil seeds into the bowl, making the crackling uh, crackle and the sorrel oil reliquify. 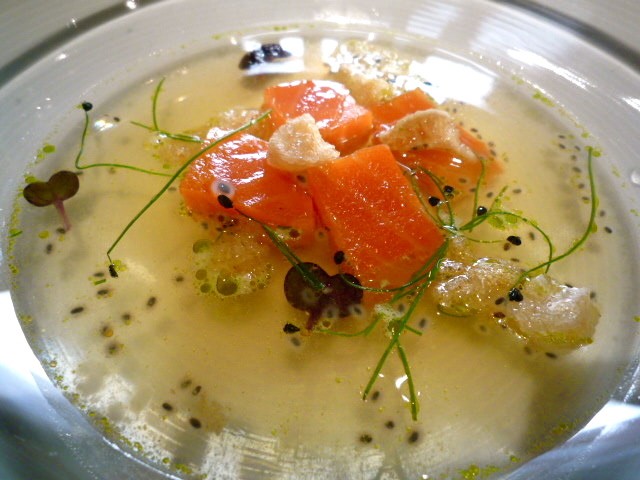 Swimming in the broth, the baby basil seeds looked even more like frogspawn than they did in Cutler & Co's ginger granita, but had a fantastic texture. And the trout was SO tender and SO smoky... I loved it. 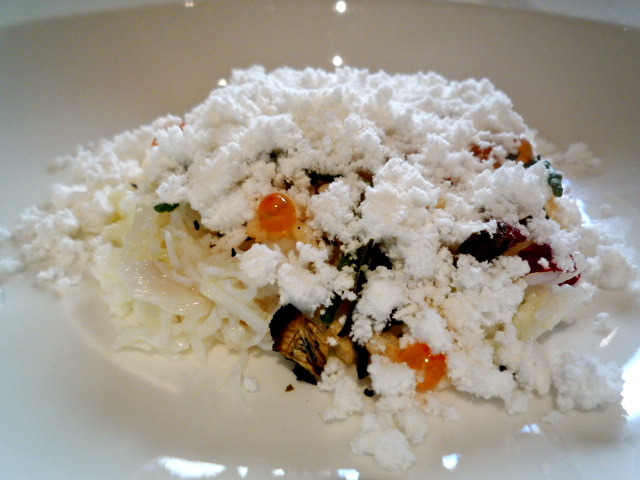 Mamma went with the Snow Crab ($25), which consisted of crab, salmon roe, puffed rice and a layer of freeze dried coconut that looked for all the world like freshly-fallen snow. Fantastic textures. 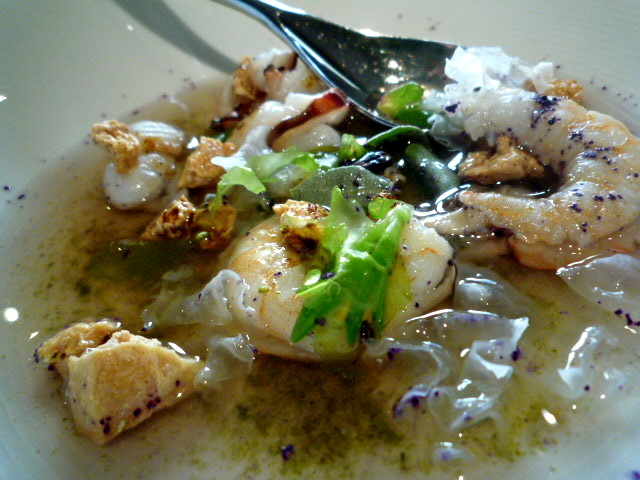 Rumpole ordered the Sea Garden ($24), which contained sea flora (seaweed) as well as fauna such as prawns and clams. As with mine it arrived dry, but with a swirl of powders at the bottom of the bowl that came to life when the beaker of hot broth was poured in. 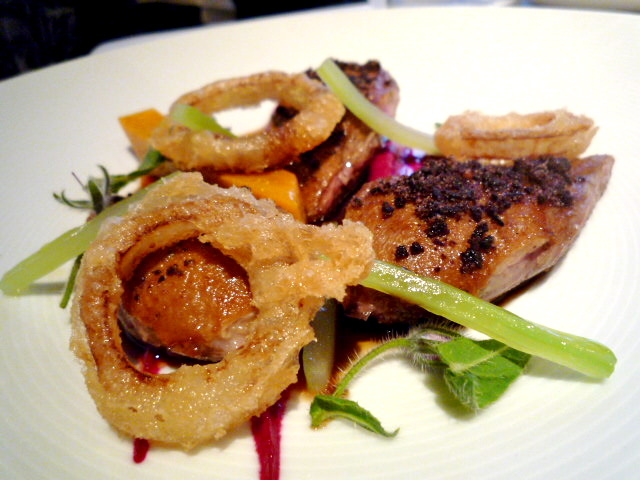 For his main, Rumpole selected the Glenloth pigeon, served with celery, borage and rings of bitter onion ($45), which he adored. 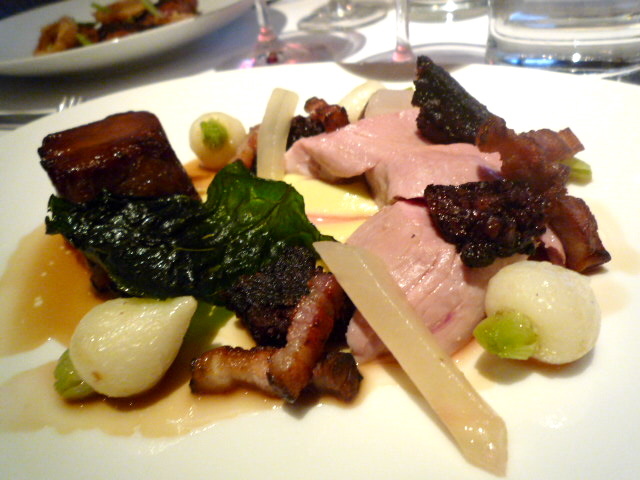 I chose the slow cooked free range pork, with confit turnips, housemade black pudding and white peach ($40). I don't normally go for pork but this was incredible: all different variations of pork. There were the poached pink bits, the tall section of pork neck on the left, the twiglets of bacon and of course the black pudding. Add to that the teeny tiny tasty turnips, the deep fried cabbage leaf and the fingers of white peach, and the dish was pretty much perfect. 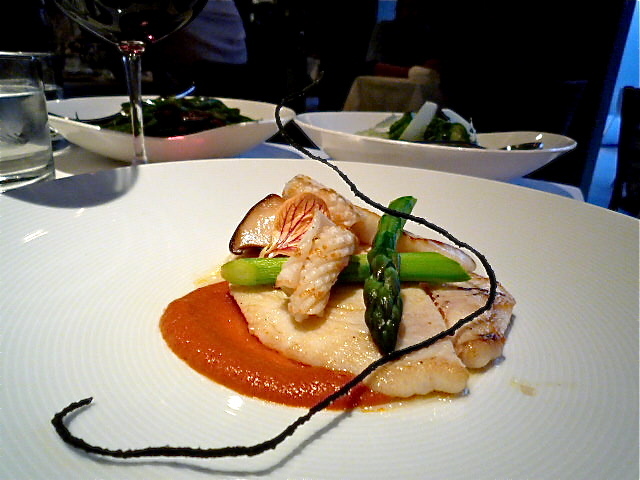 Preferring something a little more straightforward, Mamma went with the John dory in brown butter, with asparagus, baby squid and chorizo ($40). I didn't get around to tasting it but I loved the crowning touch: a delicate curlicue of a bread stick, soaked in squid ink. 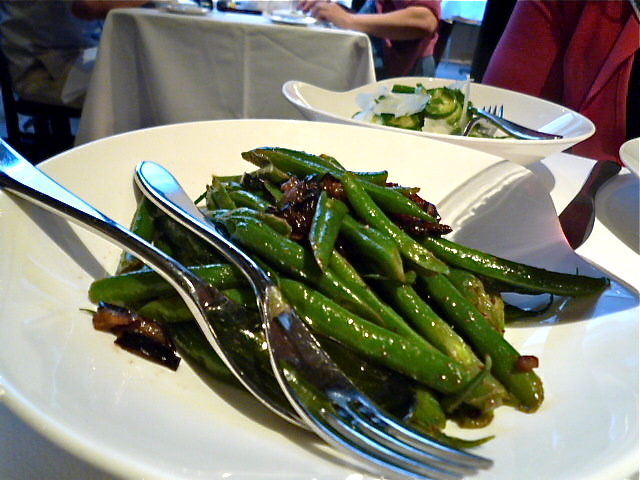 The side salads, $8 each, were simple but interesting: first cucumber, sherry and pecorino and secondly green beans, eggplant and honey. Rumpole and I shared the Terroir ($18) for dessert. 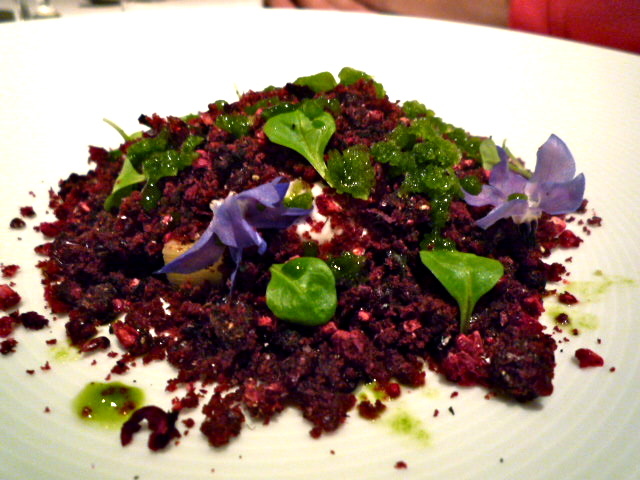 It was an extraordinary ensemble: fromage frais sorbet, fresh and dehydrated berries, beetroot and almond cake crumbs, sorrel shoots and sorrel ice, avocado oil jelly, golden kiwi fruit, borage flowers, brewing malt and white pepper. We were both fascinated: neither of us had ever tasted anything quite like it before. Extreme cuisine - try it! 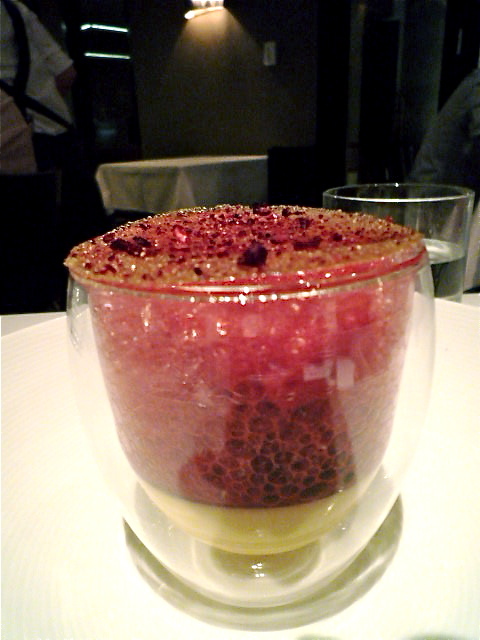 The foam was capped off with a lid of toffee, sprinkled with freeze dried blackberries. And for the record, the foam was very tasty! That meal looks absolutely incredible! Wow. I would definitely love to try that terrior dessert. The terrior sounds interesting but it kind of looks like a mess on the plate - maybe it looked better in person. And was it delicious or just interesting? I didn't know haute cuisine as such could be informal. 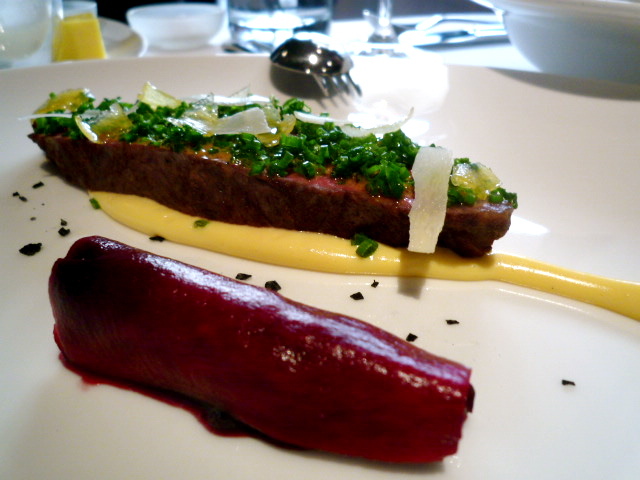 i was reading thomas keller's sous vide techniques and all when it came to molecular gastronomy. mindboggling! Hey Clare - the terroir was delicious, but in a very interesting/unusual way. It made you think!